Uncategories What is in my sewing caddies? I have 2 sewing boxes/caddies to hold sewing accessories that I move from place to place depending on what I am working on currently. Most of the time the black one on the right sits next to my machine and holds tools I use frequently as I sew. 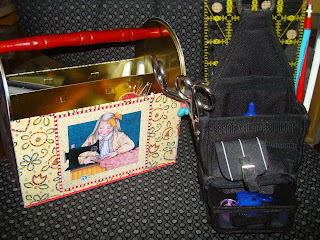 The 'ME' caddy sits next to my "sewing chair" or it goes with me in a bag for take-along projects. These little tools mainly stay at my machine. The little black caddy has a drawer for small items so they don't get lost. 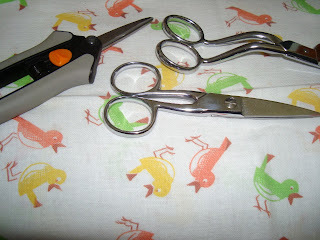 Sharp scissors are a quilter's friend. I have different uses for all of these and they stay mostly by my machine. Oh, I forgot to photo my main seam ripper - a MUST. These are items in my "to go" caddy. I have bifocals I wear from time to time but these glasses stay in the caddy but this pair stays put so I KNOW where they are. A thimble - always needed. And then this other tool that was a gift. Its taken a while to understand what most of these little items inside the tool unit are used for. The flat shovel like tip is used for "pressing" seams when my iron isn't handy. I use this a lot. 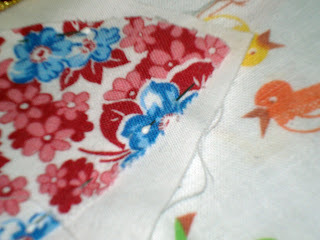 The other ones are for ripping seams, pushing out corners when an item is turned, and helpful with tiny applique. Actually there are some parts I've never used there. And there is a safety pin and tiny tweezers along with a built in measuring tape. The tool is made by Fiskars and is a good gift idea. 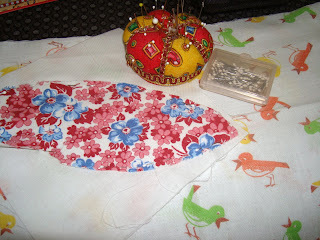 I have hand applique thread and quilting thread in different colors, needles, more scissors, a pencil and a nail file. You never know when you'll break a nail! This is my "to go" pincushion. Or one of them. I love these little applique pins in the plastic box. You can see the head of one of the white topped pins directly in the center of the above picture. They are tiny and hold the applique in place until I stitch to that point. Some people use glue to keep applique pieces in place but I prefer these tiny pins. I have a few other things too. And the contents change from time to time. I love your little sewer's tool box to go -- very cute. 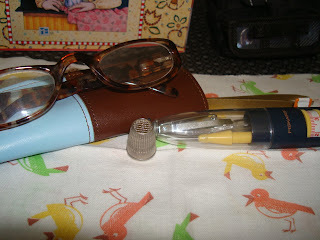 My favourite tools are my pin cushion, thimbles, tube of needles, scissors and thread. Oh -- and my portable Ott light. I don't know what I'd do without that! OK...I couldn't take my eyes off of that adorable birdie fabric!!! Every time I make a sewing-box-to-go, it gets dismantled and scattered before I need it again. But right by my machine I have a mini-wastebasket-caddy with 6 slots. It always holds the seam ripper, curved embroidery scissors and a 6" x 1" ruler that I use suprisingly often. That fiskars took collection thingy is really cool -- can you buy that in the big stores like JoAnn's or somewhere? I LOVE that cute little birdy fabric that everything is resting on! Oh ya I love those little applique pins also. In fact I wish I had another box, there great. Fun to see what others have in their sewing boxes. I have way more stuff in mine then I know I need. I keep meaning to put together an actual "to go" box that sits ready to be grabbed while running out the door for a sewing night with the peeps or a class. I hate to haul my big sewing basket. 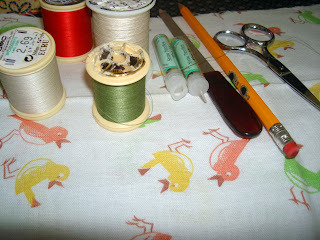 I can't concentrate on the tools at all, the bird fabric has me out of my gourd. Hi Nanette! Just yesterday I decided I *need* a travel sewing machine in a case with all it's own 'ready to go' doo dads. 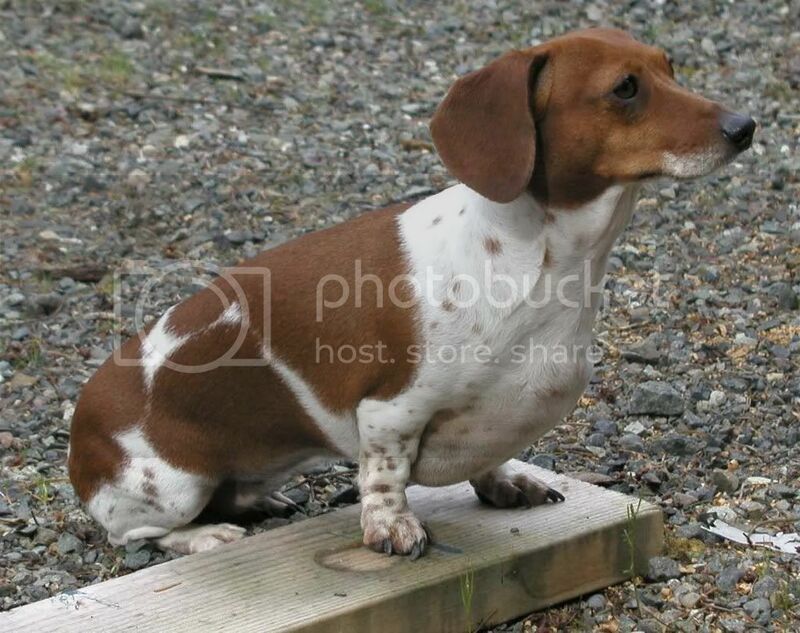 So this post was especially helpful. Thanks! ps; I plum forgot to mail the magazine last week! Too much going on to hold a thought for more than five minutes. Promise I'll do it soon tho. It's always so much fun to see what others have in their caddies, baskets, bags, boxes, etc. When I'm sewing with others I really enjoy stopping by their sewing spots to look at their treasures and gotta haves. 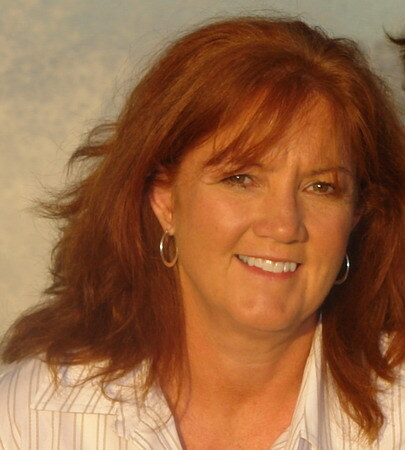 :-) Thanks for sharing yours, Nanette. Tiny pins are an absolute must. 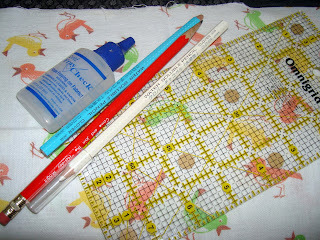 But to be honest, my favorite thing in this whole post was the birdie fabric! I don't have a box...more just an area on the kitchen counter behind my sewing machine. But, I keep my pins, extra thread, needles, scissors, machine accessories, chalk, tape measure, and of course my seam ripper there. I love your caddies. Our tools are just so vital to our lives aren't they. 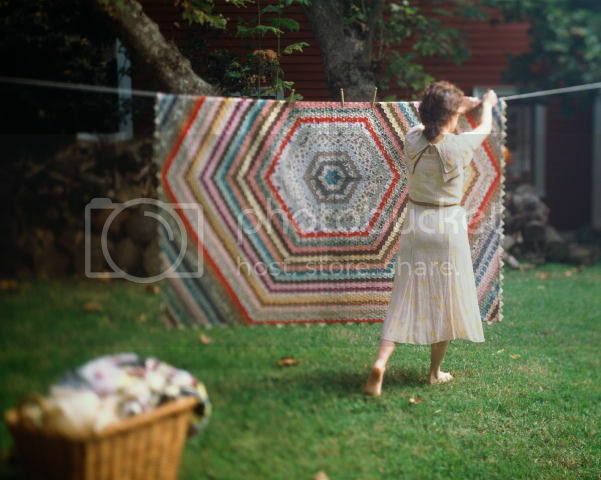 And through years of use become even more treasured. I added mine to my blog. Love that ME caddy...so cute and very helpful too. I have one "caddy" that I have for on the go sewing stuff...it is an old fresh salsa container LOL I will take pics tomorrow and share on my blog too! How fun to see all the tools you use! 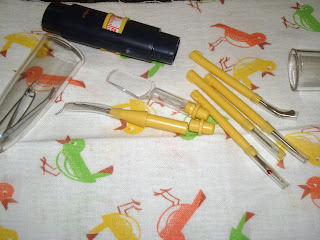 I am fascinated by those teeny tiny tools with the yellow handles. I like all your caddies, too - very cute! You are very organized! 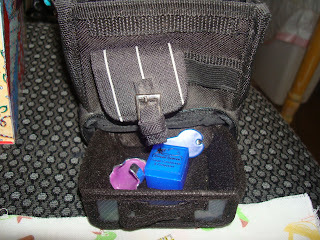 I love the sewing caddie idea and use it all the time. 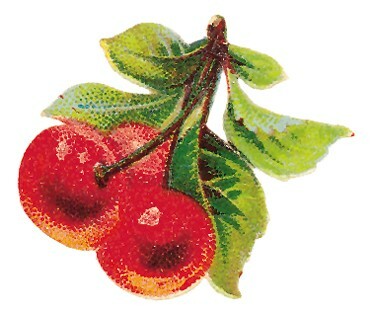 One of my favorites is a small (3" X 4") Double Bubble Bubble Gum tin. It's small enough to keep in my purse, but big enough to carry everything that I need for small projects. I loved seeing your sewing tools and gadgets, I love to get new storage baskets or containers, I have so many I sometimes forget which container has what? As usual I love to read your new posts! I don't really have a sewing caddy. Since I pretty much stay put in one room to do my projects I have different containers for stuff in there. Little drawers for bobbins and such, cans for elastic and a 'basket' with some items in it. My original sewing caddy is an old cookie tin that I nabbed for use in 7th Grade Home Ec. I believe it is in the garage now in a box. Had my scissors, tape measure, (I still have both of those items), pins and so on. I like the cans because the lid stays on. That Fiskars tool looks like a great stocking stuffer!